Welcome to the June edition of our Financial Derivatives newsletter. Earlier this month we caught up with many of our customers over coffee at our sponsored coffee breaks at IDX in London – it was good to see you all! And anyone we didn’t catch, please do get in touch with us directly if you’d like to discuss our product range or discuss future developments. It’s been a good few months in the derivatives world. 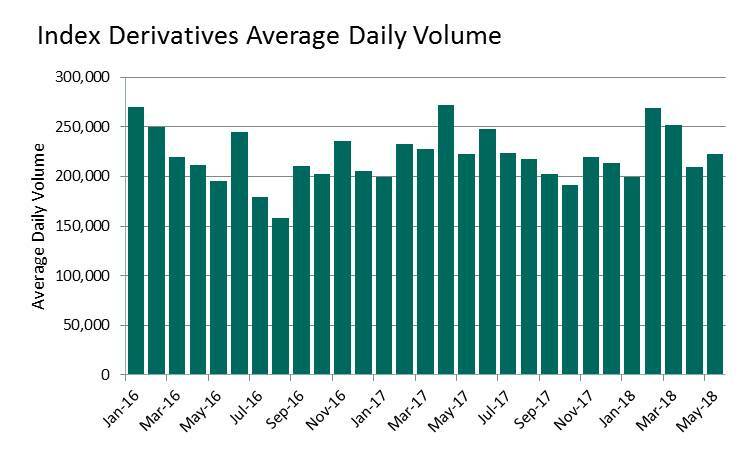 We hit a big milestone in April with the 2 billionth derivatives contract traded on Euronext Amsterdam since the opening of the market, exactly forty years ago. 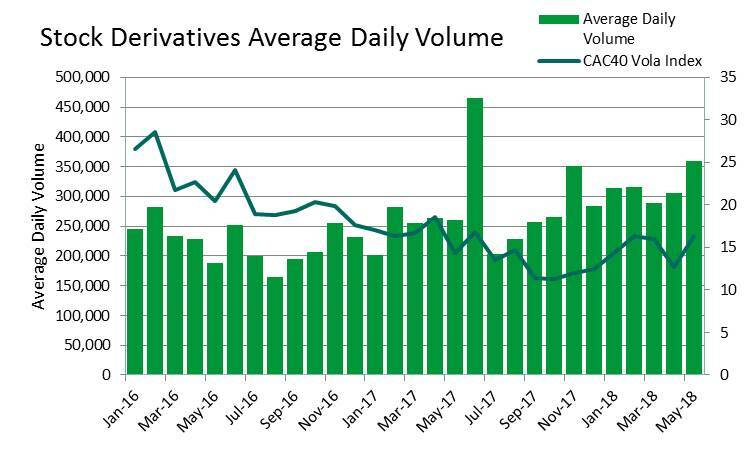 Derivatives trading volumes across our markets were up in the first quarter this year, supported by the return of volatility and the continuing improvement in Dutch options volumes. In May we visited our clients based in Chicago. This was a wonderful opportunity to see our customers’ attachment to our CAC and AEX index futures. Interest in trading these CFTC-approved contracts on Euronext is strong and we are very happy to have such a dynamic client base in the US. This month, we celebrate the 30th anniversary of our CAC 40® Index, the flagship French index that represents the performance of major French companies on the financial markets and serves as a barometer for the health of the French economy. On the regulatory side, we welcomed ESMA’s ban on the sale of binary options to retail investors. The ban is in line with our ethos of doing the best to support our customers in their business and ensuring that they are using the best products for their needs. See more about this in the regulatory section of this newsletter. Finally, we were delighted to welcome our new market, Euronext Dublin, to our business. While the business is focused on equities, debt and funds at present, we hope to introduce and develop new traded derivatives products on Euronext Dublin securities as part of our company-wide plans to develop Euronext Dublin’s significant growth potential. If you have comments on anything you read in this newsletter, have suggestions for new products you’d like to see come to market, or would just like to catch up on Derivatives developments at Euronext in general, please get in touch with our team – we’re always happy to hear from you. Trading Individual Equity Options (IEOs) on Euronext has just become even easier, with the harmonisation of Series Introduction Polices into one set of rules across the Euronext Derivatives Markets. 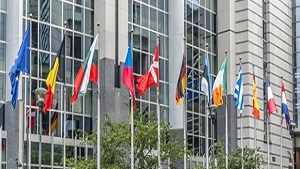 The same Exercise Price Intervals will apply across the Euronext markets for the introduction of new series in American- and European-style IEO classes with similar maturities. In practice, this means that French IEOs will now follow the more standard Euronext Amsterdam model, benefitting from greater availability of strikes. Exercise Price Ranges have also been adjusted to better accommodate for current market conditions. In addition, IEO classes that have expiry months up to 60 months will have a more granular Series Introduction Policy applied, with smaller Exercise Price Intervals in the at-the-money area closer to expiry. Members will continue to be able to request additional series in an option class according to the existing Series On Request policy. As always, Euronext will continue to monitor our policy to ensure that the most appropriate series are introduced for all Individual Equity Option classes, and may deviate from and amend the policy according to market conditions. For example, in a situation of very high or low market volatility, additional series may be introduced for a certain maturity or group of maturities, or the Exercise Price Intervals may be halved or doubled. The Spotlight Options segment allows market participants to request the creation of new option classes on Euronext’s Amsterdam, Brussels and Paris derivatives markets. Spotlight Options have short-term maturities of 1, 2 and 3 months, and are supported through a combination of liquidity provision and dedicated promotion. Two new Spotlight Options on banking group NIBC Holding, and value-adding distributor of consumer goods, B&S Group, were created on 25 May. There have been more launched this June, with the listing of Spotlight Options on long-term leasing and fleet management specialists ALD, and on Ion Beam Applications (IBA), which specialises in the design, manufacture, and marketing of cancer treatment and diagnosis equipment. Also in June, new Spotlight Options were announced on Pharming Group, which develops treatments for genetic disorders, specialty products for surgical indications, and nutritional products; and on Soitec, a manufacturer of innovative semi-conductor materials for electronic and energy sectors. Look out for these new classes in the limelight! Euronext now has 41 Spotlight Option classes available for trading. More than 900,000 Spotlight Options contracts have been traded since the launch of the segment in July 2014. More enhancements have been added to our Request for Cross (RFC) trading facility over recent months. The RFC facility is an innovative crossing mechanism that allows members to cross against a client through an open auction mechanism, in a bid to improve the efficiency of the price discovery process and assist members in attaining best execution. In the last issue of this publication, we updated you on our enhancements for MiFID II pre-trade transparency and on updates to the uncrossing algorithm. Since early April, the RFC facility has been further enhanced for equity and index options to become a true best execution facility, where the client side of the RFC will always be fully executed. This means that, in the RFC Final Execution phase, if one or both sides of the RFC are for the client account, RFC Reactors will first match against the client account side of the RFC. RFC Reactors will then match against the RFC Initiator’s other side, up to the volume of the matched client account side. When both sides of the RFC are for the client account, the matching starts with the side that trades against the reactor side with the smallest quantity. Note that these enhancements do not apply to commodity options. For more information on Request for Cross for equity and index options, email derivatives@euronext.com or speak to your relationship manager via the Client Coverage Centre. As the popularity of ETFs has increased in recent years, so has the popularity of their counterpart on the derivatives market, ETF options. 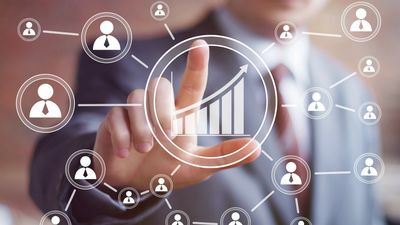 Options on ETFs offer investors, especially those already invested in ETFs, an efficient tool to hedge or leverage their ETF investments in a transparent and reliable exchange environment. As a result, more and more individual investors are joining traders and institutional investors in including ETF options in their strategies. take advantage of leverage in a transparent and reliable exchange environment. At Euronext we launched our first ETF options in December 2014, followed by weekly ETF options in April 2016. Additional options (monthly and weekly) on the iShares FTSE 100 ETF were also listed in April 2016. 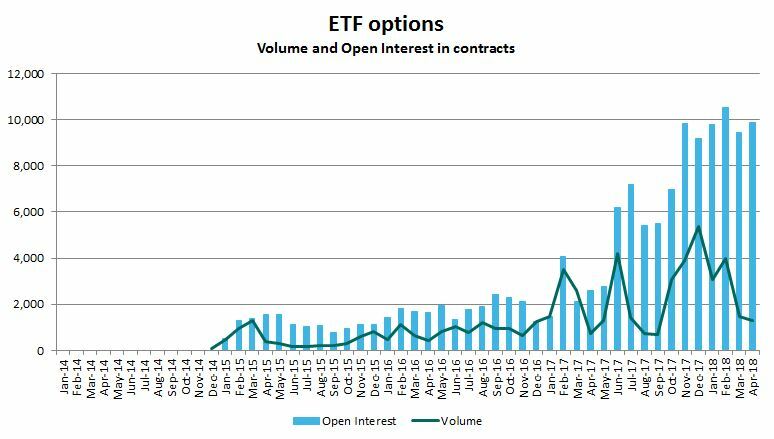 The graph below shows the growth in open interest and volumes on ETF options since launch. These options cover a carefully selected range of ETFs, providing valuable tools for trading sub-groups in the European sectors and emerging markets. With new ETF options on the horizon, we hope to continue to open up a world of possibilities. 1The use of the name of the indices is necessary to indicate the underlying value and performance of the Financial Product. These indices may be registered as trademark by third parties. The Euronext Financial Products are not sponsored, endorsed, sold or promoted by those third parties. Index derivatives allow you to gain exposure to the price movements of a whole index of stocks through a single futures or options contract. Euronext offers a range of futures and options contracts on key indices, including the Morningstar® Eurozone 50 Index℠ and our national flagship indices the AEX®, BEL 20®, PSI 20® and CAC 40®. Weeklies, dailies and Mini Index Derivatives are also available. With decades of experience in the index space, Euronext is one of the leading index providers in Europe. We have over 400 indices of all sizes of profiles, ranging from our national flagship indices to thematic, strategic and sectorial indices, as well as on-demand customised indices. 10,000+ ETPs, funds and derivatives are associated with our indices, with billions in AUM. Euronext also worked with Morningstar, the leading global provider of independent investment research, to create a new family of Morningstar open-source indices (Morningstar® Eurozone 50, Morningstar® Developed Markets 100). Earlier this year we launched a derivatives futures contract based on the Morningstar Eurozone 50 Index, a highly competitive alternative to existing index offerings in Europe with opportunities for margin offsetting against CAC 40 and AEX futures through LCH S.A. The CAC 40 Index Dividend Future is our most traded dividend derivative. Total volume traded on the CAC 40 Index Dividend Future in the first quarter 2018 reached 77,155 lots, equivalent to €137,620,000. 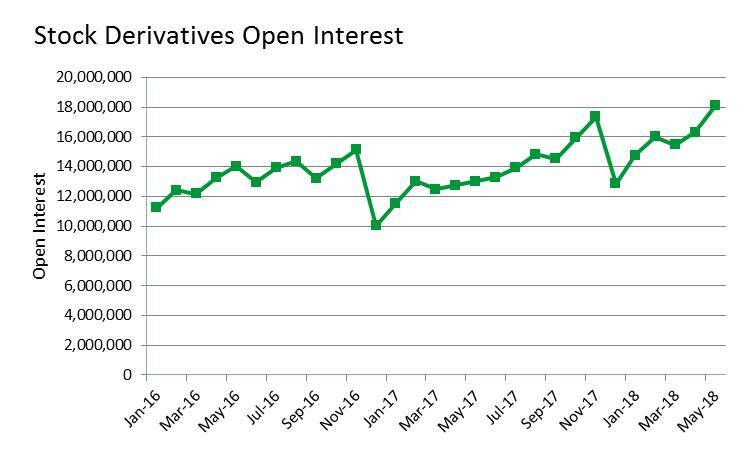 Open Interest showed a steady growth throughout the first quarter 2018 compared to Q1 2017, reaching 110,408 lots on 31 March 2018 (+33% compared to Q1 2017). Of nearly 300 Single Stock Dividend Futures contracts on offer, 152 are exclusively available at Euronext. 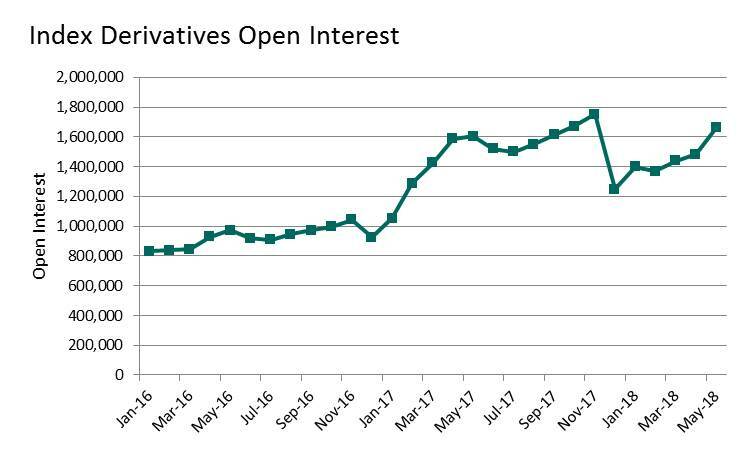 Open Interest has risen by 16% from end of Q1 2017 to end of Q1 2018, reaching 11,358 lots. Client volume represented nearly 30% of the total Single Stock Dividend Futures volume traded in Q1 2018. For more information on our Dividend Derivatives range, email derivatives@euronext.com or speak to your relationship manager via the Client Coverage Centre. Euronext provides APA and ARM services to MiFID Investment Firms who require efficient compliance at low cost. These APA/ARM services offer flexible connectivity to a multi-asset service package, serving a diverse range of clients, including members and non-members from the sellside, buyside, and proprietary firms. Discounts available for clients taking multiple products or signing up with multiple entities. To find out more about these benefits and the onboarding process, email technology@euronext.com or call +44 207 076 0907. The Government Affairs team at Euronext focuses on upcoming legislation and politically relevant discussions in the European Union that affect the Euronext markets and their constituents. Over the past few years a range of regulatory initiatives have been proposed and adopted to further regulate the financial sector. Euronext engages in the regulatory and policymaking process with the aim of securing balanced regulatory outcomes which, in taking into account all actors in the process, strengthen the role our markets play in the financing of the economy. We include below some of the regulatory issues on which the team is currently focused. Should you have issues to discuss with the team, please contact your relationship manager. The Commission proposals on prudential requirements for investment firms aim to introduce a more proportionate set of prudential rules relative to the type and size of investment firm. Euronext is monitoring these developments to ensure that these rules are applied proportionately and allow its market participants to continue their business models in the most efficient way. Amendments to this proposal were submitted by MEPs in the Economic Committee of the European Parliament in early June while Member States in the Council are also discussing their views. On 1 June, ESMA formally announced product intervention measures on CFDs and binary options. Following the introduction of MiFIR, ESMA has the authority to introduce certain product intervention measures in order to protect investors, the orderly functioning and integrity of the financial markets, or the stability of the financial system. MEPs in the Economic Committee of the European Parliament are currently debating the adoption of a report on the EU and third countries’ relationships concerning financial services regulations and supervision. The report, drafted on the initiative of the Parliament and addressed to the Commission, proposes measures to uphold and strengthen the equivalence regime post-Brexit. In so doing, it aims to ensure that a fair and equal treatment between the EU and third country firms is maintained, whilst preserving consumer protection and financial stability. In terms of the equivalence process, the report calls on the Commission to: (i) strengthen the European Supervisory Authorities’ equivalence mechanisms; (ii) enhance transparency and flexibility on the equivalence procedure; and (iii) further involve the Parliament in the Commission’s equivalence decisions via the use of delegated acts. Euronext is currently monitoring these developments with the aim of ensuring continued access to our markets in the most efficient manner possible. The Economic Committee is expected to vote on the report by mid-June, ahead of the Plenary vote expected in September. Once voted, the report will represent the European Parliament’s view on equivalence issues. It is not legally binding, which means the European Commission and other institutions may or may not take it into account in further Brexit and equivalence-related discussions.